A compact gas sensor that detects even minute quantities of hydrogen selenide – H2Se – has been developed by Sensor Electronics of Minneapolis. The highly toxic gas is used in etching silicon wafers that capture sunbeams, changing sunshine into electricity. The dangerous gas is used in other semiconductor manufacturing applications, as well as in research and design laboratories. The new sensor is designed to work in harsh atmospheres: Its stainless – steel construction shrugs off corrosive atmospheres, ignores temperature/humidity extremes. Small size – 2-inch diameter, 3.5-inch length – means it can be mounted virtually anywhere. 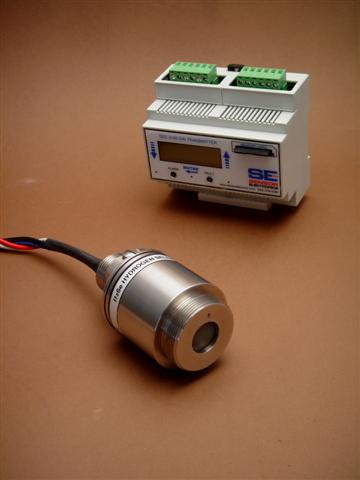 The sensor can work by itself, tie into an existing protection system, or work in tandem with its own dedicated transmitter. The transmitter reports real-time H2Se levels on a digital readout panel; in addition, color-coded LEDs go green/yellow/red as toxic levels increase. At a preset red danger level integral transmitter relays can turn on fans to flood the area with outside air, flash remote alarms, and bring help on the run. The transmitter also keeps a watchful eye on itself and the sensor, spelling out what’s wrong where in case of troubles anywhere in the system.